Finally, I made myself some (half-healthy) brookies! First, let's start off with preparing the cookie dough as it needs to chill for at least 30 minutes. In a pot, melt your butter and keep it over low heat until browned and set it aside to cool. As the water content in the butter will be evaporated during browning, measure the butter again and top it back up to 60g with a dash of strong coffee (or water, if you prefer). Then, add in your sugars and beat with a balloon whisk until well combined before beating in the half-egg and vanilla extract. Sift in the dry ingredients (flour, salt and baking powder) and fold until mostly combined before folding in your chocolate chunks until just combined. Cover with some cling wrap and place it in the fridge to firm up for at least 30 minutes or overnight for the flavours to develop. While the cookie dough is chilling, prepare your brownie batter! It couldn't be any simpler, for this is a 1 bowl recipe. First up, dump all your wet ingredients into a large bowl (applesauce, yogurt, honey and vanilla extract) and whisk until well combined. Sift in your dry ingredients (very important to sift the cocoa powder as they're always lumpy!) and mix until just combined. THAT'S IT! Pour your brownie batter into a greased/parchment lined baking pan (I used a round pan, but you can use an 8x8 square tin) and bring out your chilled dough from the fridge. Using either your hands or spoons, drop chunks (big or small, up to you!) 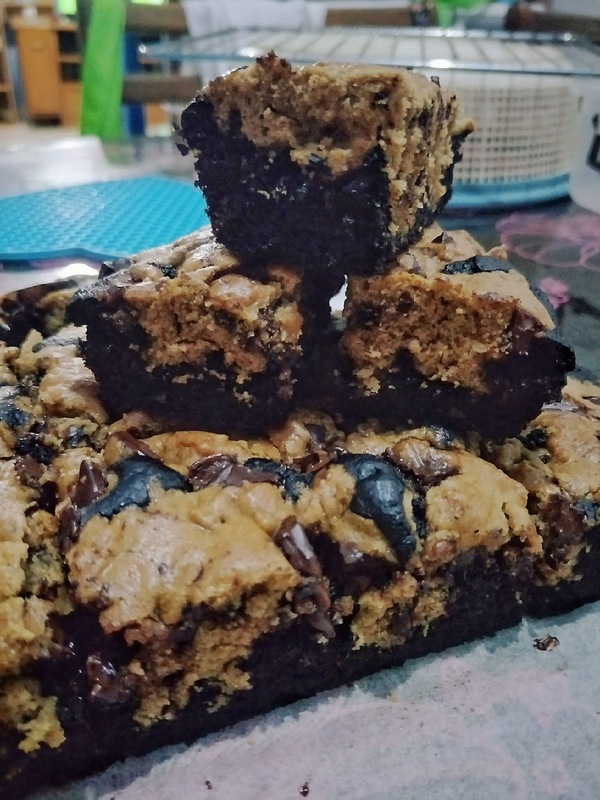 of the cookie dough all over the top of the brownie until it's mostly covered. 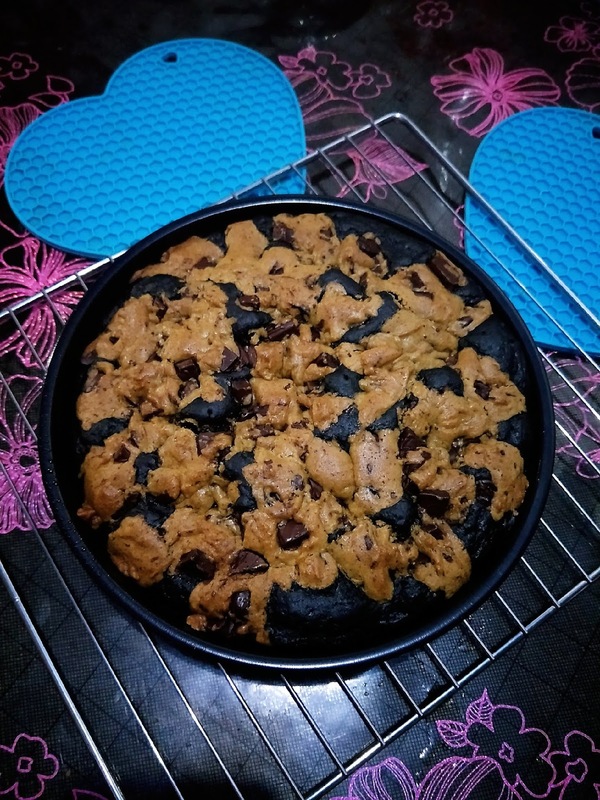 You need not make sure that the surface is 100% covered as the cookie dough will spread as it bakes. I personally did not use up all my cookie dough for the brookie (hence the "bald" patches) but leftover about 20% of the dough to bake up as some chocolate chip cookies, which I found to be too sweet. I have already reduced the sugars from tasty's recipe to begin with and used dark (and spicy) chocolates, so... I can't imagine how sweet the cookies will be if one is to follow that recipe strictly. And I do know the 70 kcal brownie looks inviting but I do not suggest that you use this brownie recipe as a straight up brownie on its own. 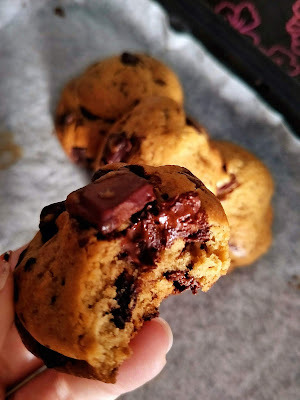 I've intentionally tone the flavour down (both the sweetness and richness of chocolate flavour) to complement the strong flavour from the cookie. In short, these two seemingly separated recipes are meant to be baked and eaten TOGETHER. 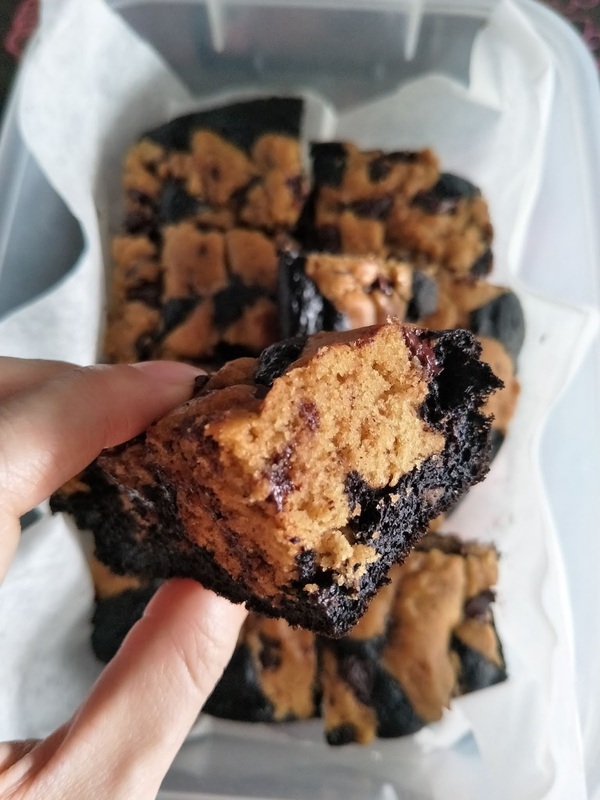 If you're bent on having a healthy, low-calorie brownie, check out my 77 kcal brownie recipe HERE. Alright, then send your brookies to bake in the oven pre-heated to 180 degree celsius for about 25 minutes until the middle has set an a skewer inserted comes out clean with just a few crumbs. Wait for the brookies to cool COMPLETELY before cutting as the cookies will be exceptionally crumbly when still warm from the oven.